Count the days to Christmas starting 1st December and finishing on Christmas Eve with this traditional Advent Calendar showing Mary, Joseph and baby Jesus with the Shepherds and Kings. Tri-fold design. 23x46x6 cm free standing printed on recycled board. 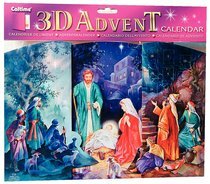 About "3d Fold Out Advent Calendar: Manger Scene With Pictures"